This budget model from Samsung just barely squeezes into the category, but it’s for good reason. 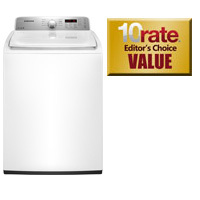 This one offers all the convenience and extra features of a high end top load washer at less than $700. First things first, this is a high efficiency model with an Energy Star rating. This way you know it cleans laundry quickly and efficiently, saving you money each month and each load. The 800RPM maximum spin speed on the spin cycle is a little slow, so there may be some more time in the dryer compared to other models. This budget model sports 9 different wash cycles to cover just about anything you can throw at it. The sense cycle uses the load size to automatically give each load a thorough cleaning. Sporting a modern, attractive style, it’s as pretty as it is functional.